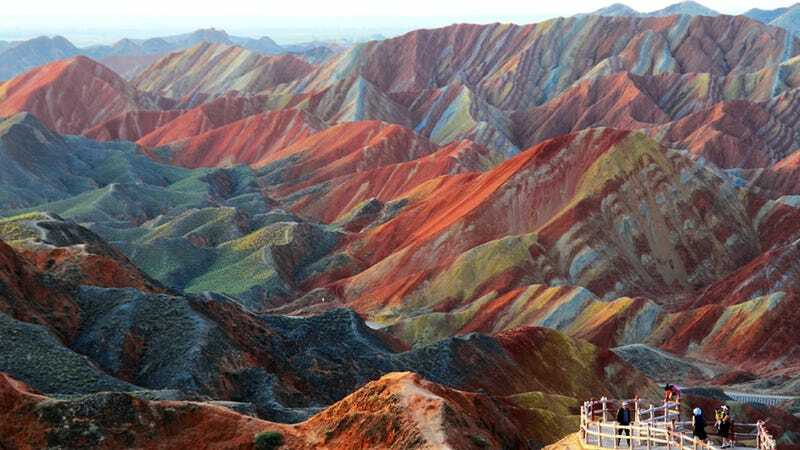 There are geological formations in China that have rightfully earned the nickname "the rainbow mountains." These colorful landscapes decorate the Zhangye Danxia Landform Geological Park in Gansu Province with colors not usually found in land formations. The mountains boast vertical stripes of vibrant reds, blues, purples, greens, and yellows. How did this natural formation, a UNESCO World Heritage Site since 2009, gain its crayonbox colors? The mountain range is made up of densely packed layers of minerals and rocks of different hues, which were formed tens of millions of years ago. When the island that would become present-day India collided with the Eurasian tectonic plate over the course of millions of years, the result was this stunning mountain range. The layers of colors got crumpled up by the collision, exposing vertical lines of varying shades. But this geology is not unique. The Spectrum Range in British Columbia is similar to China's rainbow mountains. Watch the video below to learn about more amazing places on our planet. The mountain range is made up of densely packed layers of minerals and rocks of different hues, which were formed tens of millions of years ago. Did You Know Everest Isn't The Tallest Mountain? The rainbow eucalyptus tree is another amazing piece of colorful nature.